Semi Automatic Pet blowing machine for making 20 liter pet jar (Water 20 liter Jar) If you want to blow 8 or 10 liter Matka type jar then you have purchase separate conveyor. 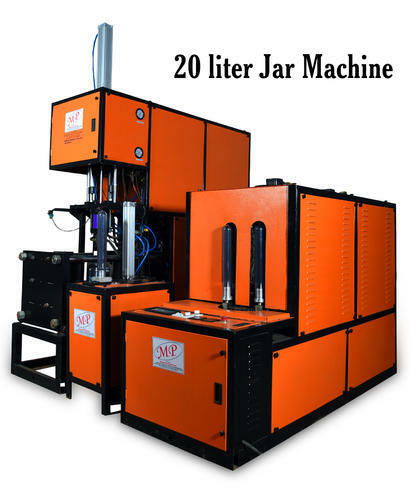 We are one of successful manufacturer 20 liter jar Semi Automatic Pet blowing machine. We had simplified the technology of the Semi Automatic Pet blowing machine which will help our buyer to use and maintain on his own (without our help). This Semi Automatic Pet blowing machine consumes very less electric power compare to other brands. To run this Semi Automatic Pet blowing machine you need not have to appoint the technical person. We will educate your any type of person to operate and maintain the Semi Automatic Pet blowing machine. Our organization is engaged in manufacturing highly durable and consisitent Pet Blow Molding Machine.We are also offering a high performing range of Pet Blow Machine, Fully Automatic Pet Blow Molding Machines, Semi Automatic Pet Blow Molding Machines, Hot Fill Pet Blow Molding Machines, Pet Blow Moulding Machine, and Pet Bottle Molds. Apart from this, we also offer , Jar Making Machine, Bottle Making Machine andPet Jar Making Machine to our clients. We do not compromise upon quality; this is why we manufacture our range utilizing high grade raw material. Assisted by a team of quality inspectors, we are able to provide superior range to our clients. All Pet Blow Machines, Plastic Blow Molding Machines and Pet Blow Moulding Machine are thoroughly checked upon their efficiency, durability and maintenance level before sending at the client’s end. Further, we are backed by a sophisticated quality control lab, which is facilitated with requisite equipment & tools and allows us to carry out routine tests. Our machines are certified with CE mark. we are the first and the only one in india to get this mark for our product quality. The CE mark demonstrates that the product meets the requirements of relevant European directives. It is an international product mark and given to those who meets the international standards.